We're pleased to present the full Q&A digest from the Letter from the Producer LIVE Part XVI! If you missed the live stream, or if you just want to watch it again (and again), check it out below! Please note that there will not be subtitles added the LIVE letter. Q: Yoshida, please let us know your overall thoughts about patch 2.3. A: I was pleased to see that players are really enjoying Frontline, but there's also still work to be done with housing. There's still a great deal of interest in in housing, and I apologize that there were not enough plots available at the release of patch 2.3. Patch 2.38 will introduce personal housing, and we'll be adding as many plots of land as we can at that time. While here at the FINAL FANTASY XIV: Full Active Time Event in Senday, I've also received feedback regarding the Hunt, and how the elite marks are being killed very quickly after they spawn. We're still considering the best approach to adjustments, but please understand we have to address this carefully. We've already raised the maximum HP of elite marks, and if we were to simply continue increasing their HP, this would only draw in more players to attack elite marks after they spawn, and the Hunt would no longer be an activity players can take part in while solo or in a small group. The Hunt was designed to offer a challenge for players to undertake at a leisurely pace, but there's an incredibly high demand for the rewards. I will address further questions about the Hunt later on during the LIVE letter, but as I said before, we have to be careful when making adjustments moving forward. On another note, I've been spending a lot of time in Frontline and I had to apologize to the Scenario Team because I haven't done any of the main scenario quests yet. I had play through them over and over while they were in-development, as well as check the cutscenes, but I didn't really have the chance to test 72-player matches in Frontline, so I've been totally immersed in it. My number of matches fought is already in the triple digits, and you can be sure I'm in there fighting whenever I have time to spare. Q: When participating in Frontline and when changing jobs during a match, we often have to reset all of our PvP actions and traits. Can you make it so these are saved for each job? A: When it comes to PvP actions, the system was made so you can freely reallocate points by resetting them, so we would like players to consider which actions they would like to enhance when changing jobs. However, in regards to making it so your actions are saved on a job by job basis so they can be used when you change jobs, we are currently looking into this and would like to make some kind of adjustment. Once it's ready for implementation we will make an announcement. The system was designed so that players can freely reset their points and reallocate them as they like, and we want players to carefully consider where they spend their points when switching from one class or job to another. With that said, we are looking into adjustments to allow the setting of PvP skills to be saved on a per job basis. We'll be sure to make an announcement wants the changes are ready for implementation. Q: Do you have any plans to expand upon Frontline? If so, what are you looking to do? A: We've been keeping tabs on the number of players from each region participating in Frontline, and Japan has actually been the highest. One comment in particular left an impression on me.They said they enjoy playing healer, and since the main objective during PvP is to eliminate the DPS and tanks, they didn't want to fight with other people at first, but after actually getting in and trying it out, they found that protecting others is really fun, and more healers have been joining as of late. We've received a lot of positive feedback, and due to its popularity, we are proactively looking into adding new maps and rules. However, we need to keep maps balanced for each of the three competing groups so there are no advantages or disadvantages, so it's going to take time. Nevertheless, rest assured we're doing what we can to introduce new PvP areas. Additionally, we'll be making adjustments to jobs for PvP in patch 2.35, with further adjustments and additions to come in patch 2.4. Also, we've been receiving feedback that, because you cannot sort the PvP results displayed at the end of a match, it's hard to award commendations to players, so we will be making adjustments to this as well. PvP requires constant adjustments to remain a viable gameplay option,, and we plan on doing just that. Q: Do you have any plans of making it random where each Grand Company starts in Frontline? A: While it's possible to shuffle around starting points, the maps were made to be extremely balanced, so there no significant differences in the layout regardless of where you start. However, there are a fewfeatures which could change things up a bit for players, so we'll try and look into this. Q: Do you have any plans to add Morale to Frontline? A: Frontline was designed to have an equal playing field, and to ensure it can be enjoyed by everyone, we do not plan on implementing Morale or other any PvP parameters in place of Morale to increase the power of players in Frontline. However, I understand that the PvP gear that can be purchased with Wolf Marks is weaker stat-wise compared to other equipment of the same item level since the effects of Morale are ignored, so we will be making adjustments to this. Q: Since the effects of Moral are not applied in Frontline, PvP gear is somewhat disadvantageous, but I really like the PvP gear and want to wear it when I play. Could you make it so Glamours can only be used for PvP gear? A: We've been discussing adjustments to the stats on PvP equipment so that it's not disadvantageous. Also, based on player feedback and the fact that you're able to distinguish each class, as well as the lead personally saying he wants to allow their use, in patch 2.35 we will be making it so Glamours can be used while participating in Frontline. However, right before coming to the event today, I heard it will be cutting it really close for a patch 2.35 implementation, so I'm not sure if it will make it in time, but we will be aiming for patch 2.35. Q: Please increase the participant cap for Frontline. A: Frankly speaking, the more participants there are, the less exciting the match becomes. For example, right now the number of participants is such that if you're the party that is in charge of the center, you have to consider whether or not you should stay in the center and focus on the drones the entire time. If you spend all your time camped out there, there will be less people maintaining the strongholds below, so the players in the middle are often in charge of looking out for the outposts. However, if we were to increase the number of participants, matches would become unbalanced, and players would just wait at the top leading into and all-out battle. We would need to create a special map for increased participant numbers, so I'm not saying that we won't consider this in the future, but at the moment I think players are enjoying themselves with the current balance. Q: Will it ever be possible to compete with fellow Grand Company members for achievements in Frontline? A: While it's not an in-game feature, we've just entered the debugging phase for a Frontline ranking system for the Lodestone, and we are planning to release this soon. With this feature you can see weekly rankings, which Grand Company is at the top and how many Wolf Marks they are accumulating, at what times are the win rates higher, and other information. We'd like players to use this as motivation to do well in Frontline. Also, we'll be at Germany's largest game show “Gamescom,” and we're planning to hold our first-ever live PvP event for FFXIV: ARR. We'd like to use the same setup to hold PvP events around the world. Additionally, while we are still discussing this, we're considering giving small bonuses to players who belong to the Grand Company that is in the top spot for the weekly ranking. Since we have both Frontline and the Wolves' Den for PvP, we'll be making updates to both of them moving forward. Q: Even after the adjustments to the Hunt on July 15, elite marks are still being killed quickly and I haven't had an opportunity to fight them. Can you please make additional adjustments? A: As I mentioned before, there is a limit when it comes to simply increasing the HP of these monsters. We're currently looking into whether we should make other types of adjustments, so please wait a bit for more details. Q: It's sometimes difficult to complete daily mark bills because the required FATEs don't spawn very often. Will there be any changes to make completion of daily mark bills easier?? A: Even in the case of atma, we've received a fair amount of feedback that FATEs are not occuring often enough, and we will continue making adjustments to the frequency with which they occur. However, having FATEs occur too frequently would deviate somewhat from the original concept, so we'll be making adjustments to FATEs with the lowest frequency. Q: The rewards for both Mark Bills and Elite Mark Bills feel low. Do you have any plans to make adjustments to this? A: We'll be making adjustments to increase the rewards for Mark Bills. However, if we were to increase the rewards for elite mark bills in the game's current state, we're concerned it would cause even more people to focus on the Hunt. We'll be looking into this carefully, but we believe increasing the rewards for daily marks will better for distribution. Q: Do you have any plans of adding elite marks that are higher than rank S? A: If we were to add elite marks that are higher than rank S they would be on the same level as Odin or Behemoth. That isn't to say we haven't discussed it, but we definitely plan to add new elite marks as we move forward, and with development of the expansion underway, we'd like to look into ranks that are above rank S. We'd also like to prioritize discussions about possibly making Odin and Behemoth a bit stronger. Q: Could you add mechanics to elite marks similar to those of bosses in dungeons and raids? A: Dungeon and raid bosses' mechanics were balanced with the specialized fields that were created for them, so it would affect both new players and the server if we applied these types of mechanics to fights in regular field areas. For now, we'd like to keep this idea on the backburner. Q: There are a lot of players who go into Syrcus Tower in order to obtain an Unidentified Allagan Tomestone or an oil of time, and it's a waste that no one is casting lots for any of the equipment. Could you put these items on a separate loot restriction? A: As all of these are items meant to enhance players, they've been set to a single loot restriction. We'd like players to decide whether they want to obtain an enhancement or gear for glamours each week. Additionally, the equipment that can be obtained from Syrcus Tower can also be for your secondary job, so if you feel it's a waste, please feel free to lot on it. Q: Will the story be completed in the next update to the Crystal Tower ? A: Patch 2.4 will bring the next update to the Coil of Bahamut, and the patch after that will see the continuation of Crystal Tower. We're planning to wrap-up the story at that time. We originally planned to introduce “The Forbidden Land, Eureka,” but we weren't able to replicate the appropriate atmosphere. “The Forbidden Land, Eureka” is a placed filled with treasure and there was a problem with what we could do about the famous magic shops. Also, we had been thinking about if we could somehow change the fact that this place housed a number of legendary weapons, and we're discussing making this separate. Q: Similar to how the Duty Finder works for Frontline now, could you make it so that players who press “Commence” enter Syrcus Tower first and then the roles that are lacking are filled afterwards? A: The queuing system we developed for Frontline was created in a rush, so it would be a bit difficult right now to use it for Crystal Tower. However, we've been working on the much awaited feature that will allow players to enter as a pre-made alliance, and it seems we will be able to implement it as scheduled in patch 2.35. Once we implement this, we'd like to address the Duty Finder in the following patch, and since another update will be made to Crystal Tower we'd like to look into it for that. Q: Previously you mentioned that going to the moon would be interesting, but do you have any information you could share about the instanced alliance raid to follow Crystal Tower? A: Our plans at the moment are progressing smoothly, and the next alliance raid series will be something original for FFXIV: ARR. It won't be related to a past FINAL FANTASY game, and will be likely be something you haven't imagined up until now, so you'll have to wait to find out. All the lore has been completed, and we've planned out how everything will develop for the most part. Once I give the OK on all the details, we'll start to gradually build the level designs, but I don't know if we will be going to the moon or not. Q: Can you please make it so equipment drops in instanced dungeons more than crafting materials? A: When I can find the time, I've been playing through my fair share of dungeons, and I came across someone that looked just like an NPC. I was really impressed with their choice of gear, but because their set wasn't complete, they've been continuously doing high level dungeons to get the items they need, but crafting materials keep dropping. Since the popularity of glamours have been increasing, I'll be talking to the item team and looking into adjustments for this. Q: In a previous Letter from the Producer LIVE you mentioned that you could be carefully looking into magic defense for dragoons. Is there any update on this? A: With the enhancements made to black mage, I've been hearing people wonder if we forgot about dragoon, but their equipment does not overlap with that of monk, and it's not like their slot in the party has been lost. Talking with players that came to today's event, I get the impression that every job has both advantages and disadvantages that make them desirable. It also seems that black mages tend to avoid encounters where there is little time to cast magic. We're aware that there are a lot of instances where bosses use magic-based attacks, and while there are a lot of opportunities to use Blood for Blood, dragoons will take a lot of damage when hit with these magic-based attacks. If we were to increase magic defense, it would result in dragoons being able to DPS without worry of magic attacks, and it would throw off job balance. I'm not saying we will not be making adjustments, but just as we made adjustments to actions in patch 2.3, we will look into this carefully considering the overall picture. Q: Please reduce the cost of equipment that can be purchased with Allied Seals. A: As this serves as a new motivation for patch 2.3, we'd like players to save up Allied Seals and aim for these items over a longer span of time. However, as I mentioned earlier, we will be making adjustments by increasing the rewards for daily Mark Bills. Q: In a previous Letter from the Producer LIVE you mentioned an update list. Is there any progress with this? A: We've been working on this bit by bit, but as I've been constantly away from the office on trips, and we've recently been working on the expansion, the release of this list has been delayed. I apologize, but please wait just a bit longer. Q: In Hullbreaker Isle, you defeat the Kraken's arms, but the body gets away. Will we see the Kraken return? A: Of course! The Kraken will be back in the not too far off future and I think you'll have to use your fists and swords against its slimy head, so get ready for it! Q: The extended version of “Slumber Disturbed” is played in Tam-Tara Deepcroft (Hard), but do you have any plans of playing other extended versions in future dungeons? A: We plan on introducing them bit by bit. Q: What exactly is that tapestry hanging behind Yoshida? A: This is artwork that was created based on Frontline. The art displays a paladin equipped with Lionsmane gear fighting in battle. In the future, we plan on using this for our overseas events. Q: Do you plan on making an actual song out of Tataru's song? A: I think that many of you have already created your own music to go along with this song, so if we were to release an official version it might not match up with what you had imagined. We'll look into it, but for now just sing the song in your head. Q: Will you be adding new ways to obtain Allied Seals in the future? A: As we just introduced allied seals, we do not have any plans of immediately adding new ways to obtain them. This doesn't mean it won't happen in the future, as we realize it's not ideal to have players soley focusing on the Hunt. As I mentioned earlier, first we'd like to work on overall adjustments. Q: What will be added in patch 2.35? A: *The video introduces the Ixali beast tribe daily quests and a special bonus for attaining the maximum rank for all of the beast tribes. In patch 2.35 we will be implementing the Ixali beast tribe daily quests, but these quests will be somewhat different from the beast tribe quests you've seen so far. Additionally, if you attain the maximum rank for all of the beast tribes, a special bonus event will be available where you work together with all of the beast tribes. Q: Will you be introducing bosses in the future similar to Giruveganaus from Stone Vigil (Hard Mode) where you have to adjust your strategy based on the monster's movement? A: With the current difficulty level players have been able to clear it quite well. We implemented this based on feedback from those asking for more random elements where you have to decide what to do based on the enemy's movement instead of dodging after seeing forewarnings. We'll be adding more challenges like this in the future, so please look forward to trying them out. Q: Do you have any plans of adding more to the Edda story? A: Personally I'm very curious about the future, but I wonder. I really want her to be happy, and players here at the event would like to see her a bit happier. I think it will all come down to your feedback, but I'm personally interested in a continuation. Q: With patch 2.4 and the implementation of rogue and ninja there will be more DPS, so do you plan on adding more full party encounters similar to Syrcus Tower with the one tank, five DPS, and two healer party composition? A: For trials and duties requiring a large number of players such as Crystal Tower in PvE or Frontline in PvP, we plan on matching players by completely ignoring roles or by having slightly different role compositions. However, for most duties that require a full party, we do not have any plans of changing the standard two tank, four DPS, and two healer composition. For the final chapter of the Coil of Bahamut that is planned for patch 2.4, this will also require a two tank, four DPS, and two healer composition. Also, while I'm on the topic of the final chapter of the Coil of Bahamut, I've gotten quite upset here and there because they are doing a lot of things and I was worried about whether or not it was okay to spend the amount of money on what they were creating. However, we've been working really hard on this, as it's the grand finale of the Seventh Umbral Era. We hope you all will enjoy the epic conclusion to the Binding Coil of Bahamut. Q: Do you plan on adding other riddle quests like “Winebaud's Riddles” in the future? A: I believe that the players who have cleared these already had quite a hard time, but it's also difficult for the team to create these kind of quests. With that said, we'll implement them bit by bit as they come up with riddles instead of making it a frequent thing. For those of you who plan on tackling these riddles after doing other things, please be sure to try it out once you've got some time. Q: In a previous interview, you mentioned that you were aiming to continue FFXIV: ARR for over 10 years, but at the moment just how far have you planned into the future? A: Well, we are already roughly thinking about where and what players will be doing in 4.0, which is to come after the next expansion we are calling “version 3.0.” We have a rough theme in mind and are continuing to plan this. Additionally, we've been planning out what kind new features we will be preparing, so with that said we are already about four years into the future planning wise. Naturally, 5.0 and beyond is a blank slate. All of the main planning for version 3.0 has pretty much been completed. Q: Do you plan on introducing clothing and hairstyles for other FINAL FANTASY series character besides just Lightning and Snow? A: We're planning to add the costume of a certain famous character as a reward in a future update. However, as I've mentioned previously, we don't plan on messing too much with the character's life from their original title. For example, in the case of Lightning, the story setting was that she came to Eorzea during her travels, and the story was organized based on this. In regards to the costume of the character I mentioned, it's separate from the story, and we'd just like players to enjoy it. We've been planning various things and it's not like we aren't thinking about stories for some of them. Q: During Letter from the Producer LIVE part XV, you mentioned that you were interested in “Evolve”. Do you have plans of adding a 4v1 type of PvP? A: As I'm sure there are those of you that did not see the previous Letter LIVE, “Evolve” is a new title that is being created by the development team that made the really great zombie FPS “Left 4 Dead”. Amongst the large amount of traditional four-player multiplayer games, this one is a five person battle. Four people play as hunters and one plays as a monster who tries to defeat the players. I had been considering something similar, and I mentioned that I was regretting that it was released ahead of my idea. Then during an interview with media at E3, they asked about potentially making something like this for FFXIV: ARR. It's not like I don't want to do something like this, but we would have to look into the methods for controlling the monster and also the interface that allows us to place monsters in real time as well as have map where you can oversee it from a god-like perspective like in the newest Fable. So with that said it will take us a long time to plan this out. I think it would be cool to have user created scenarios where one player assumes the role of game master as a monster; however, we would have to meticulously prepare this, so once we release version 3.0 and progress with the updates a bit we can try and look into this. Q: Is there any update on the weapon and armor log? A: We've currently finished off a lot of the details, but we have to plans for implementation, we've been estimating the amount of work for each. The first idea would simply have players building a collection of weapons and armor, while the second idea would allow players to read the lore surrounding the gear they obtain. However, this data will affect the player data used in real time, so we are carefully investigating this at the moment. Next week we will reach a conclusion and proceed for actual implementation, but if we decide to go with the first idea it will be implemented in patch 2.4. In the case we decide on the second option, it will be implemented a bit further in the future. In any event, we've progressed quite a bit on this and we will have our verdict soon enough. Q: Do you plan on adding more horror stories like the side quest “Corpse Groom”? A: Yoshida: While not only horror, the three new dungeons implemented this time around branched off from stories from 2.0, and I think a lot of you who spent time on the story really enjoyed them. In regards to horror stories, if there are enough requests we'll add it and we'd also like you to think of other plots. It also seems like there are a good amount of you out there that want to see an even scarier story. Perhaps it'd be good to make your gamepad vibrate and link it up with the action on screen. Soken: I'd be happy to create horror sounds. Q: Please implement a savage mode for the original Binding Coil of Bahamut. A: I received some personal feedback today asking if we could separate the progression flags for the Second Coil of Bahamut (Savage) and the Second Coil of Bahamut since there aren't new rewards for beating savage mode. We implemented the Second Coil of Bahamut (Savage) after a long time deciding whether we should implement something with that high of a difficulty, and we have to decide whether we will continue to implement separate difficulties like this moving forward. I'd like to implement this as something that is challenged for a title that does not have any flags if everyone is okay with this and will play it. While we can discuss adding savage mode for the original Binding Coil of Bahamut, that would mean that the savage mode for the final chapter of the Binding Coil of Bahamut scheduled for patch 2.4 would be pushed back. There is also a possibility that the original balance data when we made the original Binding Coil of Bahamut is gone. Q: Do you plan on adding buffer or debuffer roles? A: At the moment we plan on continuing with the three current roles: tank, DPS, and healer. If we added more roles to these three, it would become more complicated to decide which job fits into which role, and I believe new players will be joining the game in 3.0 so we don't want to make it difficult for them to understand. For the time being we would like to keep the number of roles as it is as we move forward. Q: What's going on with inappropriate behavior during the Hunt? A: I believe this is a question about third-party tools being used for the Hunt, and we are implementing countermeasures. I can't say in detail as it would give too many hints, but we are in the midst of finalizing it. Naturally, it's always a vicious circle and we've been implementing countermeasures with each patch, but this time it's a bit worse so we are raising the stakes a level. Just as I've mentioned in the past, we will be eliminating this thoroughly. Q: Did you bring anything from your mother (Takai) for show and tell today? A: Komoto: During the previous Letter LIVE I was surprised it was me who was going to the FINAL FANTASY XIV: Full Active Time Event in SENDAI. Then, Assistant Producer “M” asked me what I was going to bring and I was asking her for ideas on what to bring. It seemed like the beast tribe daily quest was going to be used beforehand, so Takai handed me a bento and told me to bring it. *The video introduces actions for ninja, which will be implemented in patch 2.4. Q: Could you tell us what you are currently in charge of? A: Komoto: I often hear people saying, “That's something that had to have been made by Komoto,” but I actually monitor overall aspects related to the implementation other than just battle. If there is a request from Yoshida to make something, I discuss with each planner what we want to do, I talk to the programmers about how we want to make something and if it's possible, and also figure out whether it's possible to expand upon something with the features we start out with. This is mainly what I do in a nutshell and I'm not really in charge of one specific thing. So with that said, my work is perhaps a little different from lead planners in the traditional sense. Yoshida: Currently for FFXIV: ARR, including myself and Komoto here, there are over 50 people who are in charge of planning the game out. Naturally with our positions it's not like I am in charge of Frontline and Komoto is in charge of housing; we oversee the big picture. Essentially, I navigate the overall project, so for example, I'll provide an overall design for a new feature or system without time restrictions in addition to one that can be played gradually overtime with limitations, and then Komoto's main job is act as the backup until it is all implemented. Another large aspect of his work is the daily briefing. Komoto: Everyday around 12:30 noon, we hold a meeting with the Community Team and Support Team and they bring up the GM-related issues that occurred the previous day and topics that were discussed on the forum, and then we discuss how to address them. The current status of everyone in the game is discussed, and when it comes to bugs we make decisions whether we should address them immediately. Additionally, I keep an eye on whether there is too much gil in circulation and look at trends to see what the economy is functioning, and especially if there are strange occurrences with huge spikes in gil circulation I'll get calls in the middle of the night and will have to address them immediately. Yoshida: During the briefing we call the “afternoon meeting” we go over bugs submitted to GMs and the forum as well as player feedback, and then decide whether to make a comment, how we can address them, and during which Hot Fix. Komoto is also in charge of making sure updates are carried out on schedule, , so with that said he is kind of our unsung hero behind the scenes. Komoto: Since I never really have any opportunities to sit and talk about the economy with everyone, I thought this would be a perfect chance to do so, and I've brought some materials to share. 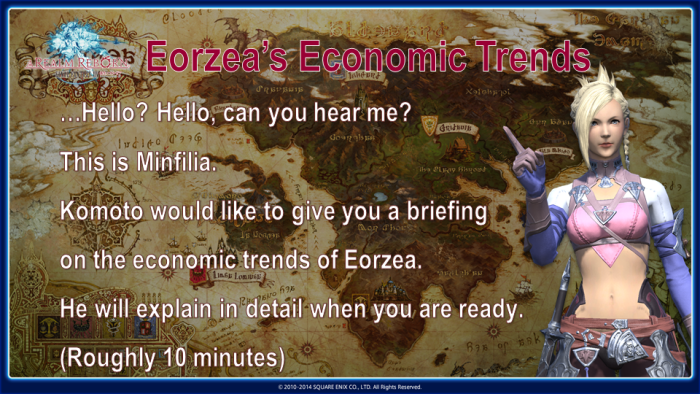 I'd like to talk about the current economic trends in Eorzea. 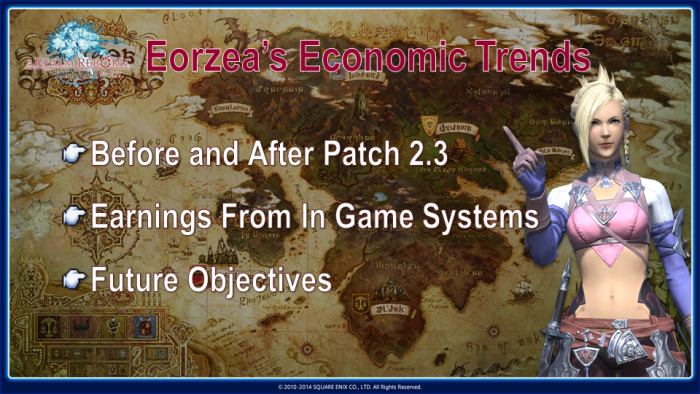 This will show the economic differences before and after patch 2.3, and I'll be explaining the changes as well as how players are receiving gil from the system and how they are putting it into the system. At the end I'll go over what kind of plans the developers are thinking about based on all of this. This first slide is of “Gil Generated from In-Game Systems.” The large yellow portion of the pie chart is drops from enemies. I realize that a bit of gil drops per enemy in dungeons, but prior to the patch this made up roughly 2/3 of overall gil. This is mainly comprised of gil that is made when repeating dungeons. 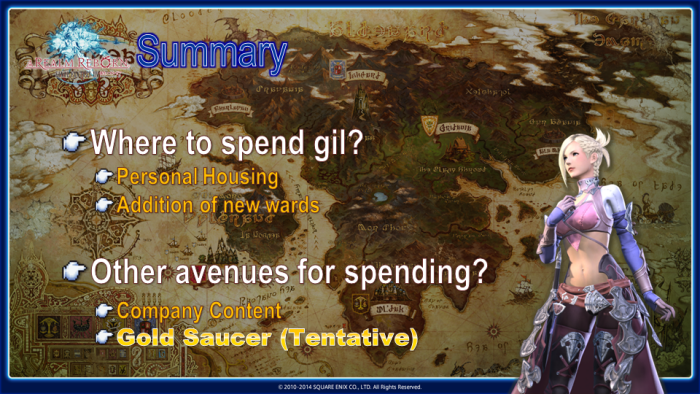 I believe you can see how everything has changed after the patch was implemented, but gil has been generated by playing through the main scenario quests and via duties other than dungeons. What's really interesting is that the total amount of gil generated is nearly without change. The development team set limitations on the amount of gil that can be generated from in-game systems by playing, but players have been able to generate profits on the market through transactions with other players. Setting limitations on the gil generated from in-game systems is important as inflation or the disruption of economic balance could occur if a proper pace is not maintained, which is the main aspect to watch over. Yoshida: And that raises the most important point. At launch we were a bit too careful and gil generation was restricted too much, which caused a lot of situations where players did not have gil. We corrected this after patch 2.1, and there are currently a variety of means for obtaining gil, which allows for players to constantly conduct transactions in the market with others. 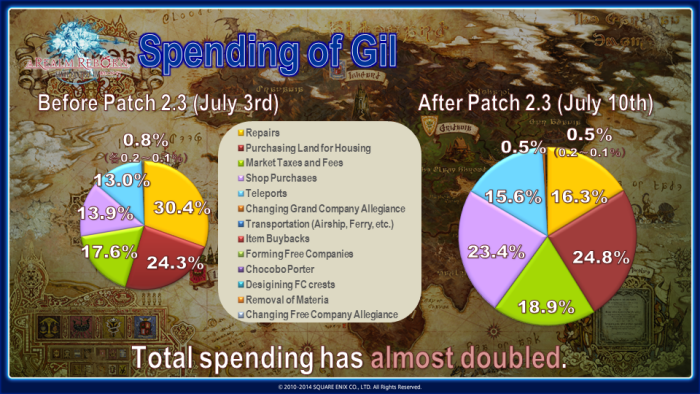 Komoto: When it comes to the spending of gil, prior to patch 2.3, as you can imagine, a large amount of gil went towards equipment repair. In the 30.4% for repair fees, the amount of gil spent on dark matter has not been included. The amount spent on grade 5 dark matter is included in the 13.9% for shop purchases, and considering these two aspects players were spending a lot of repairs daily. Additionally, prior to the patch, there were already Worlds where land was sold out, but it was still selling very consistently. The market boards were also an important point, and gil was being absorbed when players conducted transactions. Yoshida: The gil being absorbed was for the fees associated with the market board and it shows just how much was being spent in this regard. Komoto: And this is what it looks like after the patch. While it might be a bit difficult to see with the size, the total amount of spending has almost doubled. This doesn't mean that repairs have gone down, but compared to the overall picture, the percentage of gil spent on repairs has gone down. In regards to purchasing land, we added new wards and players are also spending their gil on private chambers, so this aspect is very large. 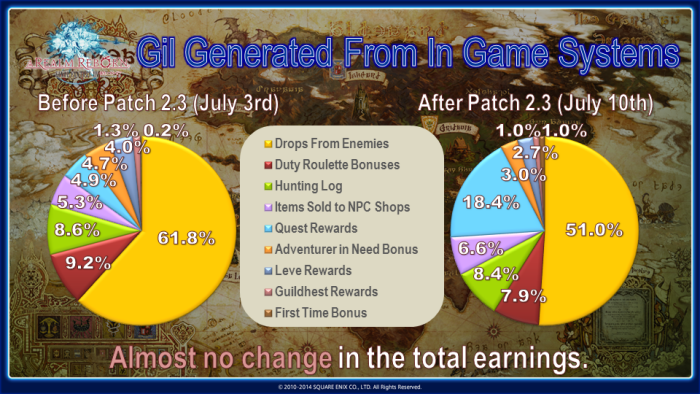 Also another important point is that the amount of gil spent on market board fees has nearly doubled due to an increase in the amount of new in-game systems; however, the percentage has barely changed. Additionally, with the implementation of these new systems and features, the amount of items that players can purchase from shops has also increased. 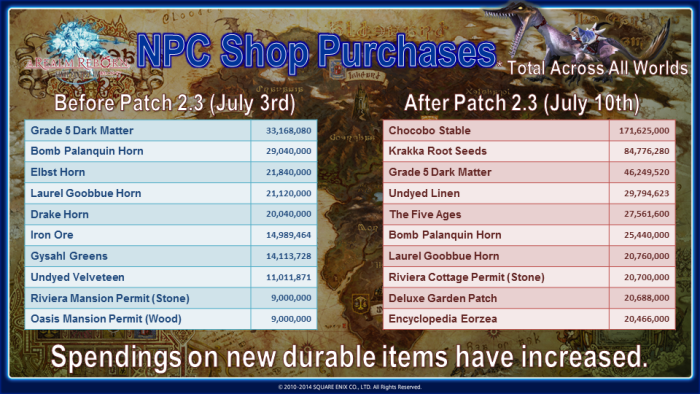 Yoshida: The point here is that with the implementation of various new recipes and item desynthesis, there are a lot of items being bought from NPC shops by players who are aiming to get-rich-quick. They then use these items to craft and such. Also, I think a lot of this percentage can be attributed to those players who first bought low value items from NPC shops to skill up desynthesis at the lower levels. So with that said, this is why there was an increase for gil spent at NPC shops. Komoto: Also, while the percentage is small, there was a slight increase in Grand Company changes. Naturally this can be attributed to the implementation of Frontline. Yoshida: While there doesn't appear to be any changes in the percentage, the amount spent has actually doubled, and due to the implementation of the patch the amount of gil spent has increased. From the players perspective it might feel like the system is taking a good portion of gil, but this is something that is critical to prevent inflation. MMORPGs are operated in this way to achieve proper economic balance, and as we've mentioned in detail, we're monitoring the conditions daily in order to do this. Komoto: Prior to the patch, grade 5 dark matter was the item that was purchased the most from NPC shops. However, second to fifth place were all mount-related, and it's a very interesting trend that the demand for these all ranked really close to dark matter. The beast tribe quest-related items were very popular. Also, there was a high demand for gysahl greens due to the changes of the companion system. Yoshida: With Atma dropping from FATEs, the increased demand for gysahl greens was apparent, especially since you could ride on chocobos while you had them summoned as a companion. Komoto: Looking at what changed after the patch, the demand for chocobo stables and krakka root seeds immediately reached the top. In regards to chocobo stables, this is the total value as of July 10th and it does not include gil spent on the day prior. Chocobo stables are continuing to be sold and players are purchasing krakka root seeds to garden and then train their chocobos. The demand for grade 5 dark matter has not changed much, but what's interesting is how much of the Five Ages that were sold. The Development Team was quite surprised when we tallied everything up. Naturally, players had a big appetite for new features and new items, and instead of using gil on items that would be consumed, everyone would rather use it on things that they can keep. With that said, with the implementation of private chambers and personal housing to be implemented in the future, I hope we'll be seeing a lot of players with items that serve as proof of adventuring. On this next slide, these are numbers that we are showing for the first time. As of July 15th, 80,000 private chambers have been sold across all Worlds. What's important to note here is that each player is spending 300,000 gil and purchasing private chambers, but this is not what is affecting economic balance; it's the purchasing of various furnishings that were made by crafters that is stimulating the economy, and this has a large impact. 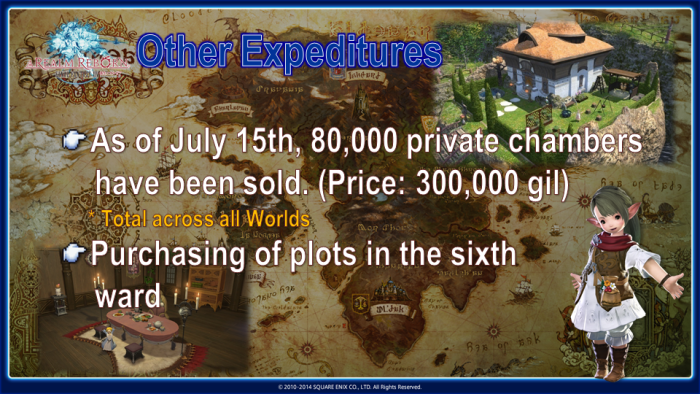 In regards to the pace in which land from the new wards were purchased, there were heavily populated Worlds on the Japan Data Centers that sold out very quickly and players were not able to buy land, but I feel this has an effect towards promoting the spending of gil and buying furnishings in the future. Once we are able to solve various stress issues and address server resources, we will be increasing the amount of new wards as much as we can. 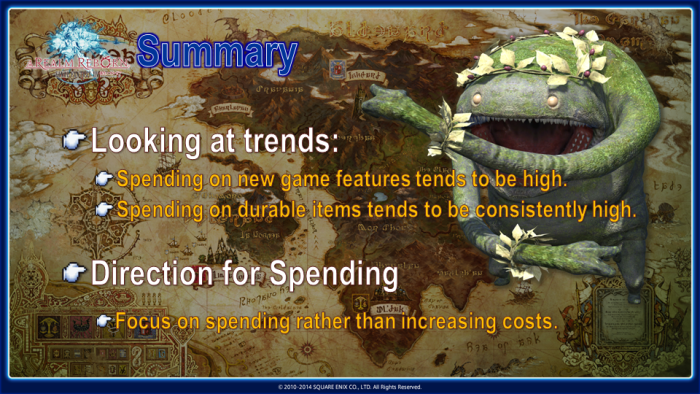 To wrap this all up, trend-wise spending on new game features tends to be high and spending on durable items tends to be consistently high. So as I mentioned before, the demand for new systems, features, and items you can hang onto is quite high. As for our plans, instead of simply focusing on increasing costs to induce the use of gil, we will be implementing new systems, which will serve to stimulate the economy through the use of gil. As for what we have planned, like I mentioned before, we will first start off with personal housing and the addition of new housing wards. Additionally, we're looking into more free company activities. We're drawing up plans at the moment for the crafting of free company airships and boats, which can be used to go on adventures and can also be reconstructed. Also, we're planning the Gold Saucer that everyone has been waiting for. Implementing this simply as a casino where players can spend their gil will not serve to stimulate the economy, so we'd like to make this into something where players exchange their gil into a different type of currency, which can then be used to play various games and gamble. Yoshida: Here's a portion of the Gold Saucer. Currently, the map design has pretty much been completed. *The video introduces an image of a portion of the Gold Saucer. Komoto: When you hear “Gold Saucer” I'm sure all of you immediately think of FFVII's Gold Saucer, and I think the most memorable feature of the Gold Saucerwas the chocobo racing. FFXI also has chocobo racing, but in FFVII you were able to ride your chocobo and control it during the race, so we're heading in the direction where you would be able to race the chocobo you've been training, and at the moment we're planning on a race between eight in a field. Yoshida: Sorry to keep you all waiting, but we are currently in the process of developing chocobo racing. Naturally that's not all we will be implementing. As Komoto mentioned previously, in-game systems can be split into two different categories. The first includes battles and monsters. This is what Gondai focuses on, which would be dungeons, raids, Frontline, the Hunt, and all the other battle systems. The other category is composed of crafting, gathering, housing, Gold Saucer, and other such systems, which are handled by Komoto. So although that falls into Komoto's category, he is not directly in charge of it. We've been talking to the planning team about chocobo racing and how we'd like to make it so you can use the chocobo you've trained and actually control it while racing. Additionally, we have one more plan in the works. Komoto: I personally really loved FFVIII's Triple Triad card game and I played it a lot. We're planning to make it so it's not simply a card game, but also gives you the option to battle NPCs like Minfillia to collect cards. So we're looking into a game card based on this idea. Yoshida: We're envisioning it as a game where you can collect cards, battle others, and hold tournaments at the Gold Saucer. Komoto: In addition to this we have a lot of other stuff planned as well. Though there are a lot of people who think that the Gold Saucer is similar to the casinos in Dragon Quest, it won't just be a casino and we're placing a lot of importance of making it an amusement park where you can have a great time and not just a place where you can make some gil. Yoshida: We're progressing extremely fast with our plans, so I hope you are all looking forward to seeing it. Q: When designing a new battle or feature, how do you decide on the rate at which players can complete it, and its difficulty? A: Komoto: It really depends on what we plan to implement. There are some aspects I shouldn't really answer myself because Gondai handles the battle aspects and I am in charge of the economic-side of things as well as deciding on the numbers based on how many transactions I think will be made in the marketplace. The most important thing is to continuously monitor completion rates along with how transactions are being made after implementation. Yoshida: On the battle-side, they decide on the percentage of players that will have cleared the encounters 2 weeks after patch release or 30 days after patch release, and then set the difficulty. Additionally, the stats of the reward items as well as the difficulty are decided based on everyone's average item level and an estimate of how many players will be clearing it as the weeks go on. For the economic-side, they monitor the numbers more, and perform Hot Fixes based on the economic conditions after patch releases. We separate these into what we call “battle” and “live,” and everything is different depending on what we're working on. Q: Could you tell us about any instances where you were able to use prior online game development experience for the development of FFXIV: ARR? A: Komoto: Just before I was talking about operations, updates, and economy, but these are all aspects that I was actually in charge of for FFXI as well, so I think that experience has been handy. Also, I'm not doing the same things, and things we weren't able to do for FFXI have become possible through the arrangement of tools to see information. Currently, the Community Team and Support Team have been collaborating with me and we're able to get various information. Yoshida: I think that having experience in operations is really big. Prior to taking over FFXIV midway, I had been the chief planner for Dragon Quest X, but naturally this was before service started for the game. When joined FFXIV, the operation cycle was very high level, so I think this experience played a big part. A: Komoto: Ramen. But I haven't had a chance to try the ramen here in Sendai yet. Yoshida: I see him take off on his bike in this hot summer weather and in one-hour goes around to two places. Q: Could you tell us an aspect you wanted to fix when you began developing FFXIV: ARR? A: More than a feeling of a certain aspect I wanted to fix, ever since Dalamud was set to fall I had been feeling very strongly about completely remaking aspects of the game. While this was also the result of failing, I felt happy about being able to remake the game, and due to this I felt really strongly about taking up the challenge to do just that instead of fix particular aspects. So with that said, I'm really happy with what we've done. Yoshida: I think it was a tough decision. Komoto is the most knowledgeable about the state of the old FFXIV, and when I told him nothing could be fixed if he didn't stick around, he stayed on the team. He is someone that is really concerned and mindful about everyone's game play each day. Operation of an MMOROG is the most important thing, so this aspect can't be lacking. He stayed on the team in order to deliver something really great to players, and has been pouring all his energy into this game, which has resulted in the delivery of FFXIV: ARR. Q: Komoto, could you tell us any instances where players' reactions were different than what you expected or an aspect of developing FFXIV: ARR you found particularly difficult? A: Komoto: In regards to a result that was different than expected, we don't make exact anticipations of what will happen, instead we set a certain range of what is allowable. The issue is when mistakes arise when an allowable range is not properly set. In regards to an instance that was outside of our expectation, we had made rules for how gil would be generated based on 1.0, but we should have discussed this plan more thoroughly and we didn't think about it enough. As a result we inconvenienced everyone. Yoshida: Additionally, there are aspects of ARR where we perhaps reflected a bit too much on 1.0. Gil is a perfect example of this, but there are other aspects that we had to look back on where we tightened it up a bit too much. Q: Could youtell us any people or works that have influenced you as a game developer? A: Komoto: The games I played the most my whole life were “Derby Stallion” and “Bestplay Baseball” by Hiroyuki Sonobe. I really like these games. Also, as a player, I spent a lot of time playing FINAL FANTASY on the SNES, and it was then that I joined Square, so I'd haveto say that FINAL FANTASY is really an influential work. Q: Is there any new information about the eternal bond system? A: Komoto: Currently, the lead is working as hard as he can, and is in the process of creating cutscenes as well as plans for being able to customize the design of the venue. You'll be able to go on quest together and then hold a ceremony. When the lead spoke to the programmer and designer they asked him if he was really going all out like this. I know Yoshida and the lead have been talking about it a lot and are getting excited, and it's turning into something really big and nice. Yoshida: Just to reiterate, this is a ceremony by which two characters pledge their devotion to each other in Eorzea. As this is really extensive system, we are aiming to implement this during the 2.4 series of patches. We are planning to have players apply via the web, and it's the real deal. I hope you are all looking forward to it. A: Komoto: It was possible to garden in FFXI with planter pots, and we would like to do this kind of thing for FFXIV: ARR as well. When we were initially planning out gardening, we were talking about having this type of feature in the future. However, gardening was designed based around the special aspect that it's important what is growing next to each plant in your garden, so we'd like to monitor this for a bit and then work on implementing something. Please give us a bit more time. A: Komoto: There have been requests for this and we've put it in our implementation plans. Though it depends on priorities, we are aiming to implement this in patch 2.4. A: Komoto: I've been talking to the programmer about implementing this feature to coincide with the implementation of personal housing, and we're doing our best to make it in time. Though there is a possibility that the implementation timing changes, this is something that will be possible. A: Komoto: As a player myself I understand the requests to increase the amount of space in Company Chests and feel it would be good to have a bit more. However, when it comes to adding a rack it might not be the best way of going about things since it could contribute to problems revolving around having to remember where you put your items. Personally I feel that it would be best to keep things simple so players can play the game easily. Yoshida: There's an issue where we won't be able to increase the amount of land if we allocate too much data resources to houses. Our plan is to first add as much land as we can. After this, we'd like players to build a lot of houses and once the needs of the players have been met we would like to increase the amount of items that can be placed. We are placing the highest priority on making it so a lot of players can possess a house, and then we will look into increase the amount of items that can be placed. Q: When logging out in private chambers, upon logging in again we are placed outside of houses. Could you make it like inns so that we log back into our rooms? A: Komoto: I understand that since implementation we've been receiving a lot of feedback about this, but this is an issue that is actually quite deep and we are not able to address it right away at the moment. Inns, similar to instanced dungeons, have been made so they are set to standby where no resources are consumed when players are not present. For houses as well the programmers were able to work on it so they do not consume resources either when players are not present, but as a result of this, when logging back into the game the room resources do not exist, so there is a difficult issue about how to make it so you can log back in to your rooms. Q: The magicked stable broom cost is too high, so please make it so we can use the magic broom minion instead to clean our stables. A: Komoto: I apologize about this. Just as I was asked earlier, this is exactly something that was outside of what was anticipated. We will be changing the recipe so that a larger amount can be made for a lower cost. However, as there are not necessarily a lot of players who belong to a free company that own a house and can craft this item, we'll also make it so NPC shops sell these as well for the minimum of this cost. Even on the World I play on, they are being sold at a very high price, so we will be making adjustments to drive these prices down. Q: I feel that the cost and difficulty for cleaning stables and growing food for chocobo raising is too high. Can you make adjustments so this is more accessible? A: Komoto: For cleaning stables we will do as I just mentioned. Again, I am very sorry. In regards to vegetables, we feel it's just right at the moment, but I think that the methods for growing these vegetables haven't been completely uncovered just yet. As there are no HQ items that can be grown from krakka root seeds, we'd like players to try and use shroud soil and such to increase their yield. Q: Please make it so we can have different stats or raise our chocobo differently depending on the types of food we feed it. A: Komoto: At the moment we are not looking into features like this. Since chocobo raising is done at free company houses, other members can feed your chocobo, and there is a possibility where they could feed it the wrong type of food. We'll look into ways that we can prevent this, but for the moment our plan is to prioritize making it easy for free company members to take care of each other's chocobos. Yoshida: In regards to chocobo stats, we'll be looking into training for certain aspects that are geared towards the previously mentioned chocobo racing. As I said during the previous Letter LIVE, this is not the end of chocobo raising. We plan on adding a separate feature to chocobo stables in order to boost your stats. Q: Currently it's only possible to obtain the vegetables for chocobo raising via gardening, but do you have any plans to add other methods for obtaining them? A: Komoto: This all depends on the amount in circulation, but for now I don't think it is as severe as the situation with the magicked stable broom. We'd like players to utilize their gardens as much as they can to grow these vegetables. Adding more ways to obtain them would reduce the value of gardens, so we need to balance this carefully. Q: Is demimateria only available through desynthesis? A: Komoto: At the moment, demimateria is only obtainable through item desynthesis. Q: In regards to the main tools implemented in patch 2.3 for gatherers, please make it so we can obtain the necessary items without desynthesis. A: Komoto: Currently, we'd like to keep these as items you obtain by desynthesizing items. Yoshida: Similar to what I was saying about the battle system, we've made it so items that have value right after implementation are obtained via newly added systems, so at the moment we do not have plans to make adjustments or add new ways of obtaining them. However, once a bit of time passes it's a possibility that we will do so. Q: Could you please add more gear for crafters so that we can increase our desynthesis skills more efficiently? A: This sounds like a request for parameters that relate to desynth skill similar to the stats for increased spiritbond gain, and I think that's a great idea It's beginning to get tough to increase my own desynth skill, and it seems like everyone else is in the same spot as well. However, we're also considering other means of enhancing desynthesis such as food, so you can rest assured we'll take this into consideration as we move forward. Q: Currently it's not possible to desynthesize item level 95 equipment, but in the future will it be possible? A: Komoto: Yes, it will. Once the cap is raised on average item level, players will be able to desynthesize item level 95 equipment. Yoshida: I mentioned this briefly in the past, but the current desynthesis skill maximum is 300, but we are planning to raise this to 400 with the cap increase.